When it comes to burgers, I prefer turkey over beef, but the burgers have to be good ones. Unfortunately, because turkey is so lean, when made into burgers they can be quite dry unless you add in some other ingredients to add moisture. I started to make these turkey burgers last year when I had the whole family here for the holidays, and they are now my “go to” burgers. The vegetables add just enough moisture so that whether you grill or fry the burgers on the stovetop they always remain moist. Lean ground turkey gives this burger a much healthier nutrition profile than a traditional beef burger. Place the carrots, onions, and garlic in a food processor and pulse until finely chopped. Add the turkey, salt, pepper, worcestershire, and hot sauce, and pulse until blended. Divide turkey mixture into 4 equal portions, shaping each into a 3/4-inch-thick patty. Place patties on grill rack coated with cooking spray, and grill 6 minutes on each side or until done. 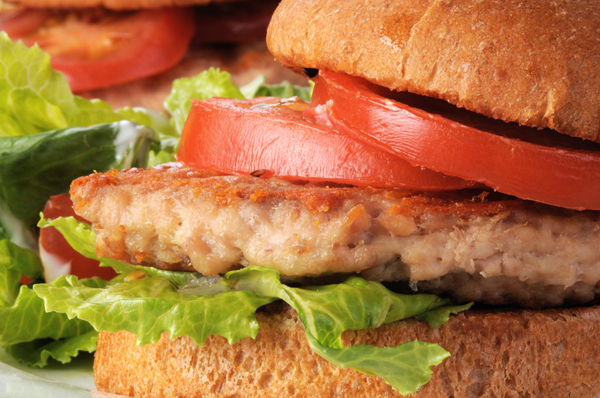 Serve on whole wheat buns with lettuce, tomatoes, and condiments of choice.